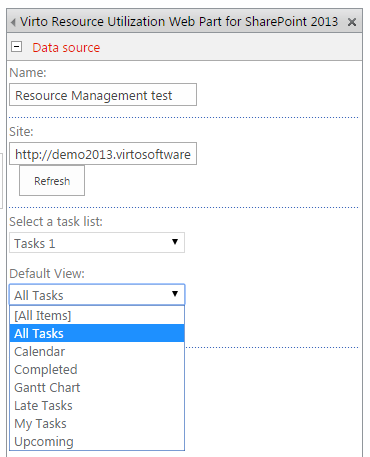 To adjust Resource Management view for SharePoint list, you need to define data source settings first of all. Go to web part settings (“Edit Web Part”). Expand “Data source” block. 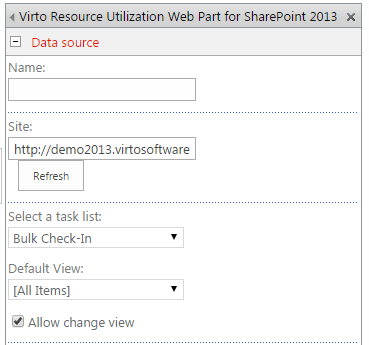 First of all enter the route to site where the source list is located and select SharePoint list. Define a default view that will be used when you open the chart. Check the box “Allow change view” to allow users changing a view when they open web part. Then you need to match fields from Resource Management web part with source list fields. 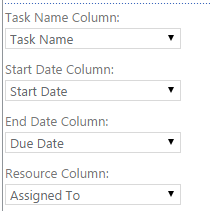 Four fields are required: “Task Name Column”, “Start Date Column”, “End Date Column” and “Resource Column”. Note: any column can be selected as a source column for resources. These fields are required. If they are defined, Resource Management chart will be displayed correctly. However you can also define percent complete field. Define order of columns and amount of frozen columns if necessary (always displayed on the left). You can define default task duration. 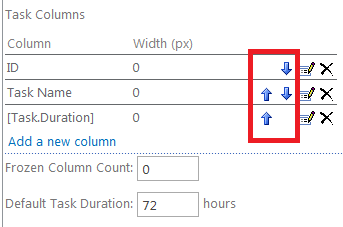 Check the box “Read only” to disallow users to edit structure or titles of tasks in the chart. Check the box “Show attachments icon” to show icons for items with attachments. 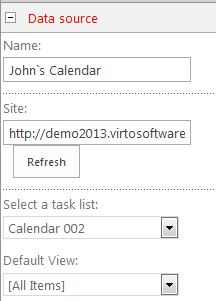 Also, you can show Task name column as a link and single task interval as a link. 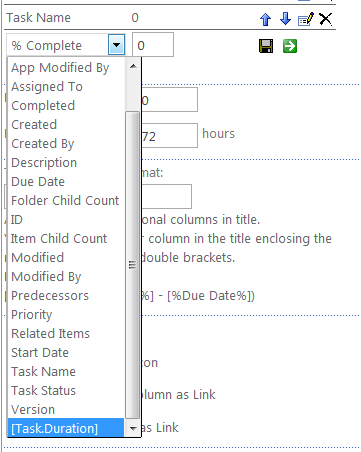 To define which form will be displayed when new task is being added, select required mode in the New task mode block. Creating tasks with a mouse option is default, you can switch it off. You can also predefine values for a new task. 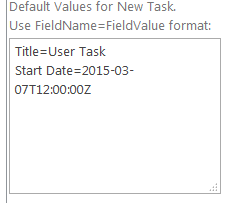 Set required parameters in the “Field Name=Field Value” format. 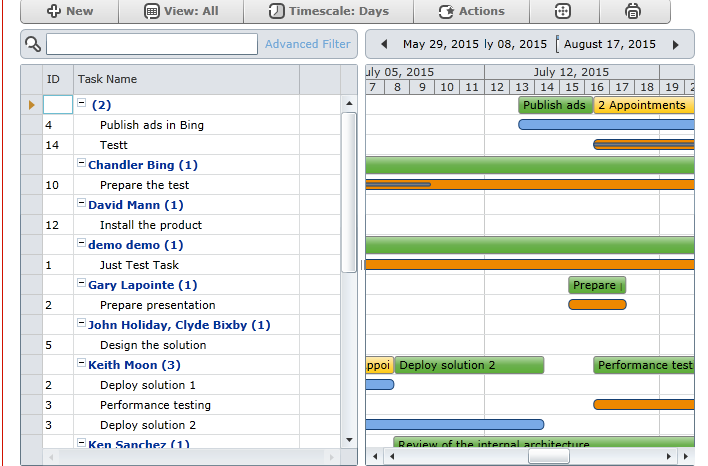 You can add other lists as data sources and display tasks from different lists in a single Gantt view. 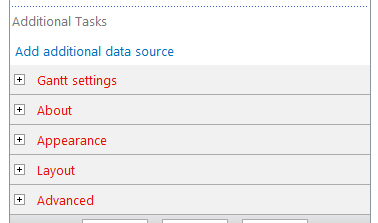 Settings for additional tasks are defined in “Additional Tasks” block. 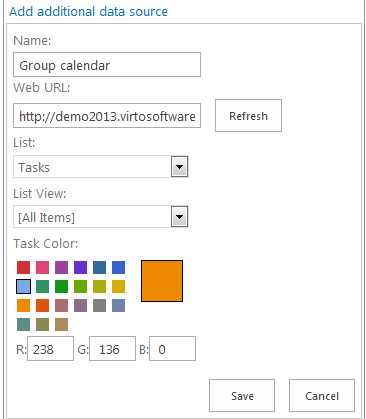 Then select task color for the chart (in RGB) and click “Save” to save the settings. 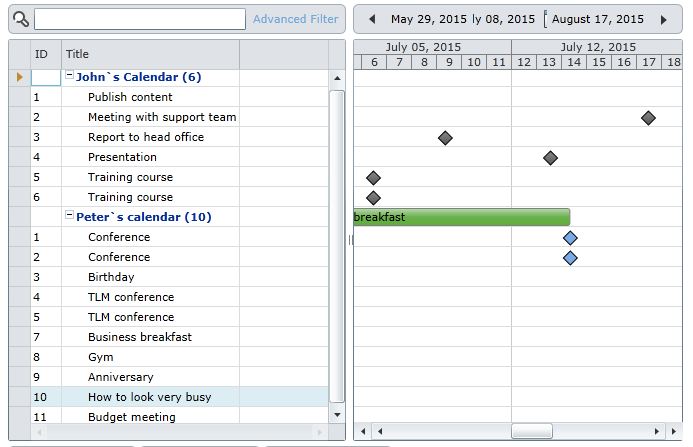 Now tasks from both data sources will be displayed in the Gantt web part. If resource is a data source, you can select “Data source name” in a “Resource Column” field to show data source name as a resource in Gantt Resource web part. 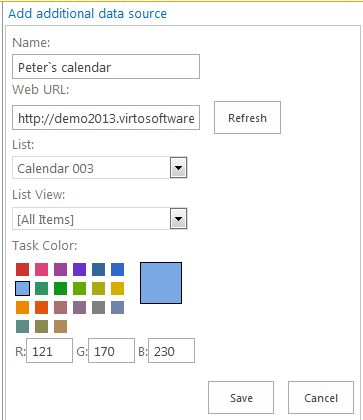 For instance you can display tasks from calendars of two SharePoint users. 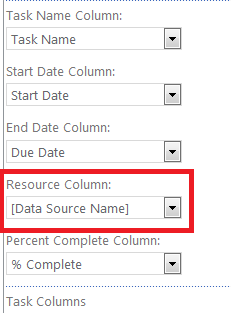 Select “Data Source Name” in “Resource Column”. Data source names will be displayed in the Resource Utilization web part.